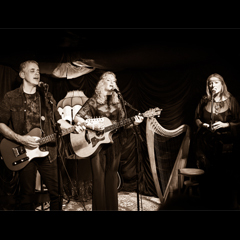 In April 2017, The Heather Findlay Trio took to the intimacy of a stripped back, laid back show in London town resulting in the unique and beautifully low-lit, Rembrandt-esque, 'Aces & Eights - A Night In The Saloon Bar' film. Paring down the wall of sound usually found in the full line up of The Heather Findlay Band, Sarah Dean on harp, vocals, percussion and woodwind, and Martin Ledger, lead guitar and vocals, join Findlay on acoustic guitar and woodwind, to form a trio that manages to reveal more than just the fragility one might anticipate from a semi-acoustic performance with a surprising amount of power in explosive bursts of energetic frisson. Expect all the delicacy, warmth, humour and camaraderie as if the trio were playing in your own living room!